A giant jellyfish, Stygiomedusa gigantea, has been filmed in the Gulf of Mexico. It’s tentacles are 10 meters long and the bell is over half a meter wide. Check out the video below of this denizen of the deep. Hat tip to Deep Sea News. 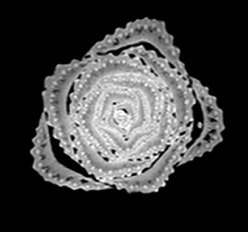 I have stumbled across Inside Insides, a blog of fruit and vegetables as seen through an MRI machine. Each fruit or vege has an animation, so you can see inside it from one end to another. Pictured is a screen shot of the latest entry – celery. Me favourites be the broccoli which looks like fireworks and the artichoke which looks like a kaleidoscope. Is this another example of art and science? The line is so blurry now we pirates get confused. I started this video back in January and 95% finished it before I moved to Canberra and bought a laptop. I haven’t had a chance to complete it and upload it… until now. The montage part is my favourite. Oceans aren’t the only thing that respond to the moon. The land has tides as well. My videos are all found on my YouTube Channel. If you love me or fear me, click through and RANK ME OR WALK THE PLANK! It’s unbelievable that the ground beneath you actually moves up twice a day, just like the tides. Imagine what that must mean for the tectonic plates. Seismic activity is involved to make it happen. The vibrations are very slow, but Earth Sound have recordings of it sped up so we can hear it. Back in the days before antibiotics, syphilis was a dreadful problem encountered on occasion by hapless sailors on shore leave bewitched by young maidens. Fortunately they could use their super-secret special handshake to detect syphilis. A demonstration is below, feel free to use it when dating. Amazing! And you can sneak it in when dancing if you miss your opportunity for the greeting handshake. Thanks to Mr. Science Show, the man in the video for the hat tip.